In collaboration with organic chemists, we discovered a new promising approach to treat the inflammatory component of glaucoma. This could help us generate new glaucoma drugs complementary to existing therapies and protecting the vision of patients more effectively. One new compound with the potential to become a novel drug for diabetic retinopathy by protecting the nerve cells in the eye. A medical device for patients with diabetes that would allow the physician to assess the risk for diabetic retinopathy, and would allow the patient to continuously monitor the disease’s progress and therapy success through a simple blood test requiring only a finger prick blood sample. Two new potential drugs to treat the dry form of AMD , one new potential drug to treat diabetic retinopathy caused by Type 1 diabetes and two new potential drugs to treat glaucoma are in advanced stages of development. Two new drug delivery approaches for established wet AMD drugs that would eliminate the need for frequent injections in the eye. A medical device for AMD patients and those with occlusion of their retinal blood vessels which could ultimately eliminate lengthy, invasive procedures. A new drug delivery approach for established glaucoma drugs that would eliminate the need for daily eye drops– specifically, we are looking to turn glaucoma drugs into a slow release version administered only a few times per year. A medical device that will reduce the pressure in the eye of patients for which conventional glaucoma drug treatment failed and surgery is the only option. Bryan Gerdes, left, and Jacob Kraus, standing, have received UMKC School of Graduate Studies Research Awards. Two graduate students from UMKC’s Interdisciplinary Studies Ph.D. program, who conduct their research at the School of Medicine’s Vision Research Center, have received UMKC School of Graduate Studies Research Awards. 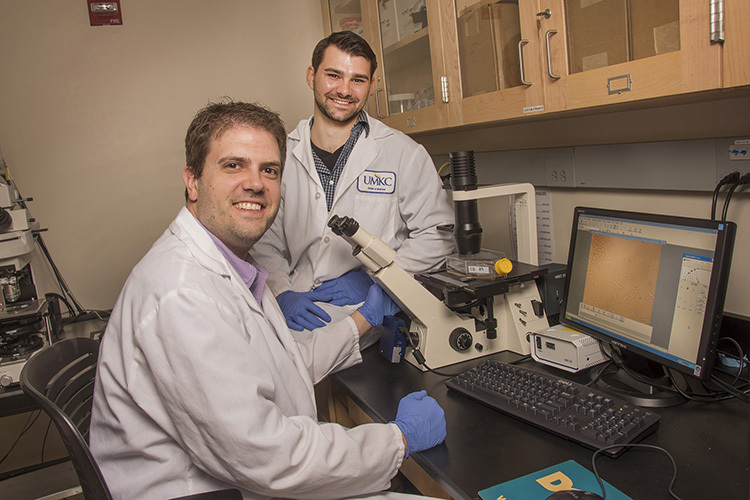 Bryan Gerdes and Jacob Kraus, both working on their PhDs under the mentorship of Peter Koulen, PhD, director of basic research at the Vision Research Center, received awards for 2016-2017. Gerdes received an award for his project on the identification of novel cellular pathways controlling oxidative stress in nerve cells. 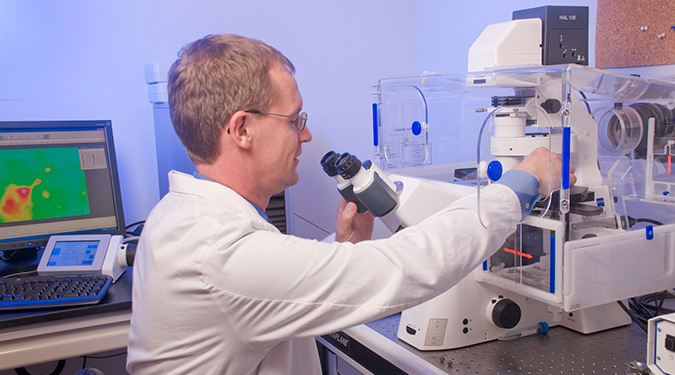 Kraus is studying the mechanisms of action of neuro-protective compounds for his PhD thesis. The research awards are designed to elevate the visibility of research and the economic development activities taking place at the university. Recipients present their work at the annual Community of Scholars Symposium and Awards Ceremony sponsored each spring by the School of Graduate Studies. 2000. The data also includes an 89 percent spike in diabetic eye disease over the last decade. Chicago, IL (PRWEB) June 20, 2012 — More adult Americans are facing the reality of eye disease than ever before. According to the 2012 update of the “Vision Problems in the U.S.” report, a study released today by Prevent Blindness America and the National Eye Institute, the number of those ages 40 and older with vision impairment and blindness has increased 23 percent since the year 2000. The study, conducted by researchers from Johns Hopkins University, provides prevalence rates and estimates cases of age-related eye conditions. A full version of the study is available at preventblindness.org/visionproblems. “It’s no surprise that the numbers of those affected by eye disease are continuing to climb, especially due to the aging Baby Boomer population,” said Hugh R. Parry, president and CEO of Prevent Blindness America. “What is exceptionally concerning is the dramatic spike in diabetic retinopathy cases, a consequence of the diabetes epidemic that this country is experiencing with no end in sight.” Diabetes is the leading cause of new cases of blindness in adults 20-74 years of age. According to the Centers for Disease Control, diabetes affects 25.8 million people in the United States. Although there is no cure for diabetic eye disease, annual eye exams for diabetes patients are essential to help slow the progression of the disease. programs and research. These services are made possible through the generous support of the American public. fund, call 1-800-331-2020. Or, visit us on the Web at preventblindness.org or facebook.com/preventblindness. Don Alexander is one of the leaders in our business community whom I most respect. The Dutch-born banker-turned-entrepreneur has been a huge success in everything he has touched. Just as in commerce, when he embraces a cause in the world of philanthropy, I certainly take notice. After Marshall Dean III introduced me to Vision Research Center of Kansas City, where he is a foundation director, I learned that Don Alexander also was an enthusiastic director and supporter. A lengthy visit to the Vision Research Center at the University of Missouri-Kansas City, 2300 Holmes Road, convinced me how right Don is. I spent several hours with the center’s amazingly capable advancement director, Bridgette O’Connor, and Dr. Peter Koulen, the center’s director of basic research. Kansas City is incredibly fortunate to have a research scientist like Koulen in our town. He was trained at the Max Planck Institute for Brain Research in Germany and at the Yale University School of Medicine. He came here from the University of North Texas Health Sciences Center, where he served as director of its eye research institute. 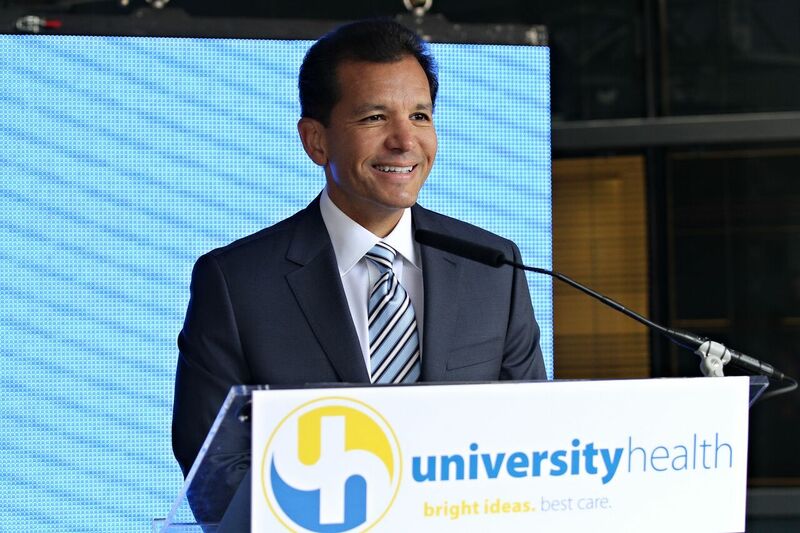 I came away from my time with him realizing that he is a leader in the quest to discover better treatments for diabetic retinopathy, glaucoma and macular degeneration. He also is extremely articulate and very personable. The mission of VRC began in 2007. It is to develop prevention strategies and cures for the three debilitating eye diseases that Koulen focuses on. It is the research program of the Department of Ophthalmology at the UMKC School of Medicine, and it has been endorsed by the Kansas City Area Life Sciences Institute Inc. During my visit, I quickly understood what Don Alexander had told me. Typically, it takes a long time for researchers’ discoveries to reach a patient’s bedside. The process is greatly expedited at VRC because of the close proximity of research scientists, clinicians and practicing ophthalmologists. This institution is an incredible and, unfortunately, relatively unknown Kansas City asset. It is likely that major breakthroughs in conquering the three age-related debilitative eye diseases will occur right here in our town. The Vision Research Center deserves the financial and manpower support of our business community. What could be more important than the development of preventive methods and new treatments to save vision? Don Alexander is right on.